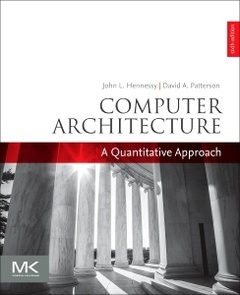 Computer Architecture (6th Ed.) Hennessy John L., Patterson David A.
Auteurs : Hennessy John L., Patterson David A.
John L. Hennessy is a Professor of Electrical Engineering and Computer Science at Stanford University, where he has been a member of the faculty since 1977 and was, from 2000 to 2016, its tenth President. Prof. Hennessy is a Fellow of the IEEE and ACM; a member of the National Academy of Engineering, the National Academy of Science, and the American Philosophical Society; and a Fellow of the American Academy of Arts and Sciences. Among his many awards are the 2001 Eckert-Mauchly Award for his contributions to RISC technology, the 2001 Seymour Cray Computer Engineering Award, and the 2000 John von Neumann Award, which he shared with David Patterson. He has also received seven honorary doctorates. David A. Patterson is the Pardee Chair of Computer Science, Emeritus at the University of California Berkeley. His teaching has been honored by the Distinguished Teaching Award from the University of California, the Karlstrom Award from ACM, and the Mulligan Education Medal and Undergraduate Teaching Award from IEEE. Patterson received the IEEE Technical Achievement Award and the ACM Eckert-Mauchly Award for contributions to RISC, and he shared the IEEE Johnson Information Storage Award for contributions to RAID. He also shared the IEEE John von Neumann Medal and the C & C Prize with John Hennessy. Like his co-author, Patterson is a Fellow of the American Academy of Arts and Sciences, the Computer History Museum, ACM, and IEEE, and he was elected to the National Academy of Engineering, the National Academy of Sciences, and the Silicon Valley Engineering Hall of Fame. He served on the Information Technology Advisory Committee to the U.S. President, as chair of the CS division in the Berkeley EECS department, as chair of the Computing Research Association, and as President of ACM. This record led to Distinguished Service Awards from ACM, CRA, and SIGARCH.